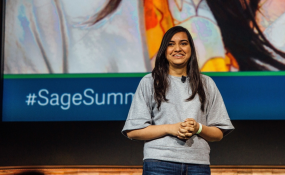 Kriti Sharma, VP of AI at Sage. When we launched rAINbow, an artificial intelligence-powered smart companion that aims to democratise support for victims of domestic violence, in November last year, we did not expect that it would facilitate over 150,000 conversations with South Africans in just over 3 months. This speaks to the fact - as President Ramaphosa noted in his State of the Nation address - that violence against women and children has reached "epidemic proportions" and that something needs to be done urgently. The President outlined government's planned efforts to stop the scourge of abuse, which include launching a Summit to coordinate a national response, dedicating more funds to support centres and national hotlines, improving the functioning of sexual offences courts and specialised units, and shutting down shebeens and liquor outlets near schools. These are commendable efforts, but we believe that together we can do so much more. Combatting abuse isn't the government's responsibility alone. It's society's responsibility, including corporates, NGOs and ordinary citizens. It's our responsibility because it affects all of us. One of the reasons we believed artificial intelligence can fill a gap in victim support, is the fact that so many find it difficult to talk to another person about their experience, due to embarrassment, social and cultural taboos, and shame. rAInbow, developed with funding partner Sage Foundation and social justice organisation, The Soul City Institute, is a smart companion that allows users to 'chat' to a non-human over Facebook Messenger. It provides a safe space for domestic violence victims to access information about their rights, support options, and where they can find help - in friendly, simple language. Aside from providing a non-judgemental interface for victims to initiate seeking help, the data gathered by rAInbow in its conversations with South Africans- all anonymised - provides invaluable insight into this very complex issue; insight we can use to improve our communication and prevention strategies. We've identified five common themes in the conversations rAInbow has with users. It's concerning to note that women are unsure if they're experiencing abuse because they've tolerated it for so long that it now seems natural and normal. Infidelity. Issues related to infidelity or cheating were an area of concern for many. Also concerning was the number of users who reported that their partners abandoned them during pregnancy. Alcohol and substance abuse. Alcohol and drugs are common triggers for violent episodes, with users saying their partners were more likely to lash out at them verbally or physically after they'd been drinking. Digital abuse. Around 30% of users believe it's acceptable for their partners to check their phones and to insist on knowing who they're talking to at all times. This constitutes a form of emotional abuse. Verbal abuse and threats. Before chatting to rAInbow, users had a lower awareness of what constitutes verbal abuse and threats. Understanding the signs. There is a keen interest in understanding the various signs of abuse, including physical and sexual abuse, in relationships. We need targeted, personalised education drives that help victims identify abuse and explain how and where to get help. There is a strong need for information, yet victims don't want to speak to another person about their situations, nor will they go to the police or support centres for help. These are powerful insights that, in just three months, have us thinking differently about how to approach this issue in society. Established institutions are playing a critical role in providing support to victims. But, people find taking the first step in confiding in another person, and seeking help from these institutions, incredibly difficult. One solution is artificial intelligence technology, like rAINbow, that will get better and better at helping victims, as it identifies patterns in victims' stories, conversations and language. It's these types of solutions, made possible by technologists, philanthropists and NGOs - with the financial support and backing of corp-orates and the public sector - that can have a massive impact in combating abuse. It's all in the data and how we use it to make better decisions about action plans and strategies. It's solutions like rAInbow that can provide governments with the information they need to tackle abuse.